A telescopic handler, commonly known as a telehandler is a versatile type of lifting plant that includes a telescopic boom fitted with a lifting attachment. The typical lifting attachment used is a fork tyne, but other attachments are used depending on the load lifted. Telehandlers can vary in function – from their primary use as a telescopic forklift to lifting suspended loads as a crane or being used as an elevating work platform (EWP) by using a work platform attachment. Our RIIHAN309E Operate Telescopic Materials Handler unit covers conducting telescopic materials handler operations in the resources and infrastructure industries. 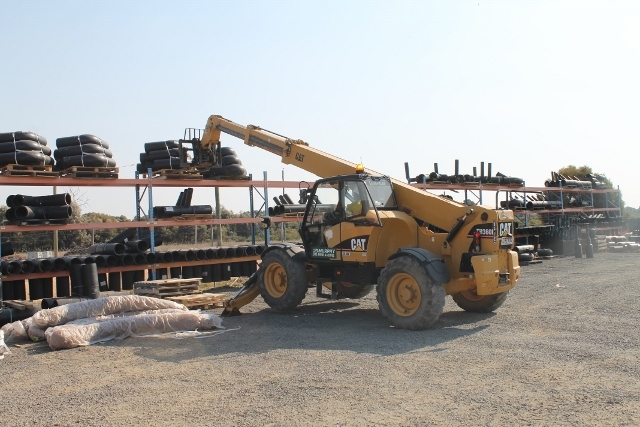 It includes planning and preparing; conducting machine pre-operational checks; operating the telescopic materials handler; attaching, securing, lifting, carrying and placing materials; selecting, removing and fitting attachments; carrying out machine operator maintenance; and cleaning up. At the successful completion of this course the trainee will be awarded a statement of attainment which is Nationally recognised and a wallet sized photo ID card listing the telehandler competency. All training delivered through Smiths Training Services in partnership with our partner RTO’s is Nationally recognised.